What happens when you’re reading two books at once? Or reading one and listening to the other? Depending on whether the two are the same genre I can either keep them completely separate or start to confuse them. In the case of Wild: From Lost to Found on the Pacific Crest Trail (read) and All My Puny Sorrows (listened) the protagonists were distinct, but there were many similarities – women of a relatively similar age, dealing with family tragedy, undergoing some horrifying experiences and (spoiler alert) coming through it in the end. One major difference is that the Sorrows character is Canadian and the Wild character is American. And they do approach their predicaments in ways that often epitomize their nationalities. From the New York Times’ Book Review, here is Curtis Sittenfeld’s quick summary of what happens in All My Puny Sorrows. Yoli has traveled to Winnipeg from her home in Toronto because her sister, Elfrieda, a brilliant and successful classical pianist, has — not for the first time — attempted suicide. Elfrieda, a.k.a. Elf, is now in the psychiatric unit of a hospital, and most of the book’s suspense arises from the questions of whether she’ll attempt suicide again and whether she’ll persuade Yoli to help her. Many pages are devoted to the daily pattern of waiting out a family member’s hospital stay: trying to extract information from doctors and nurses, trying not to let non-hospital-related obligations fall into disarray, hugging, crying, hugging while crying, procuring food and sleeping (usually not well). So Yoli contemplates and equivocates. Should she or should she not help her sister commit suicide? Should she continue with her absurd love affairs? Should she go back to Toronto to look after her daughter? What should she do about her mother? The nature of Yoli’s questions seems quintessentially Canadian. We’re a contemplative bunch. We don’t want to just jump into things without serious analysis. Cheryl Strayed of Wild, on the other hand, jumps into all kinds of dangerous situations. So does Yoli in some ways but she does have that all-important Canadian health care system and social safety net to keep her from the grinding poverty and the near-death experiences of the American Cheryl. The overriding theme of Wild, however, is not one of contemplation – although Cheryl declares she wants to find herself by hiking the Pacific Crest Trail. This memoir is about re-inventing oneself and literally pulling yourself up by your bootstraps – there’s even a picture of a boot on the cover. And how American is that? And of course Wild was made into a movie starring the spunky Reese Witherspoon. This memoir lends itself perfectly to sweeping cinematography and Cheryl’s physical exertions. Yoli’s predicament, however, is mostly cerebral and her forays into the medical realm are dark and claustrophobic. There are moments of unanticipated humour, however – also dark and more typical of north of the 49th parallel. Altogether less visual than the topography of the American west coast. I wouldn’t have thought of reading these two books together or even comparing them but it just happened and I couldn’t help but notice the similarity of the situations of the two women and their startling options. 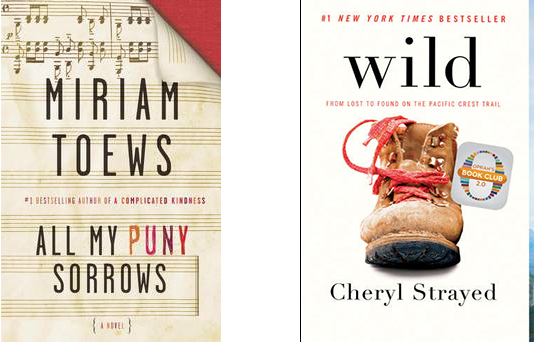 Wild is unabashedly a memoir – written some years after its events – while All My Puny Sorrows is a novel inspired by the real life suicide of the author’s sister and father. In Wild, Cheryl’s erratic behavior and ultimate trek was provoked by her mother’s illness and sudden early death. Cheryl has to figure out how to prevail and truly change her life. Miriam Towes (the author of All My Puny Sorrows) constructs a novel to help her make sense of the turmoil left after her family’s tragedy. I know many people who read several books at once. I do that occasionally but there’s always one book I’d rather focus on. In the case of Wild and All My Puny Sorrows I didn’t have to choose since I listened to one when I was in my car and read the other in the comfort of home – an ideal set-up. And because of this concurrence I saw more clearly, and perhaps more incisively, the similarities and distinctions of two women depicted in contemporary writing.